Police are investigating several incidents of thieves taking wheels from cars in one neighborhood in Fremont. 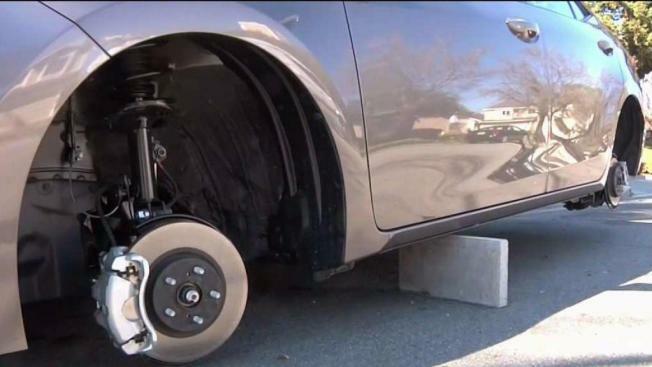 At least three new cars near the city's Ardenwood neighborhood were stripped of its wheels this week, police said. Daniel and Silvia Vasquez, who purchased their brand new Toyota less than two weeks ago, are one of the victims. Police were at their door shortly after 4 a.m. Tuesday exlaining to them several in the area had also been hit. "They took the four wheels out of the cars and they were all brand new cars," Daniel Vasquez said. Vasquez expects four new wheels will cost close to $300. In addition to Vasquez's Toyota, two new Honda Accords were also left teetering in the area after being stripped of its wheels.